We all knew that the Limited Nissan GTR has completely sold out in Malaysia. Lucky that I still managed to get one it from Litt Tak for this Giveaway contest. Apply your creativity on the Mini Capsule Tomica you get during this promotion period. Most creative post will win the prize, to stimulate your brain, I have attached 1 example below. But I know you can do better than this. Thanks Litt Tak for this sponsorship, and here is how you could win. 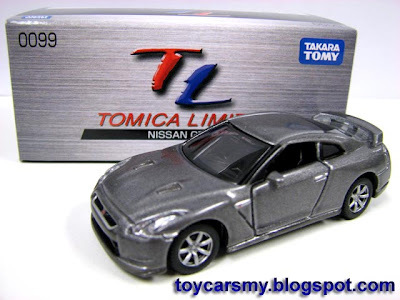 Models: Exclusively for Tomica and Mini Capture Tomica only. 1. Send in as many as your entries to my email account [cpyeo(at)toycarsmy(dot)com], entries will be posted in my blog later. 2. Most creative entry will win the prizes, and this to be selected by the author (me). Winner will receive the prize by normal Post Malaysia registered mail, no postage fee applied. 1. Only open to Malaysian, sorry for the rest who also interested. 2. Resize pictures to 640x480 in Jpeg format, no amendment or changes will be made to your entries. According to some collectors, TL0099 has restock in Litt Tak, 6 units on them. "Err... sir, before we discuss who has the right of way.. may I suggest that you first remove your right wheel off my windshield?" i dont have a mini capsule tomica.. can i summit a alternate picture similar to the mini capsule tomica? as in a mini car but not a tomica brand? i haven been able to get a MCT.. I afraid if you don't send with Mini Tomica, you may not have advantage when come to shortlisting process. Last day for GIA iV, please submit your entry today.